Innovative indexing and high performing inserts. This is how you improve CNC swiss automatic lathes. 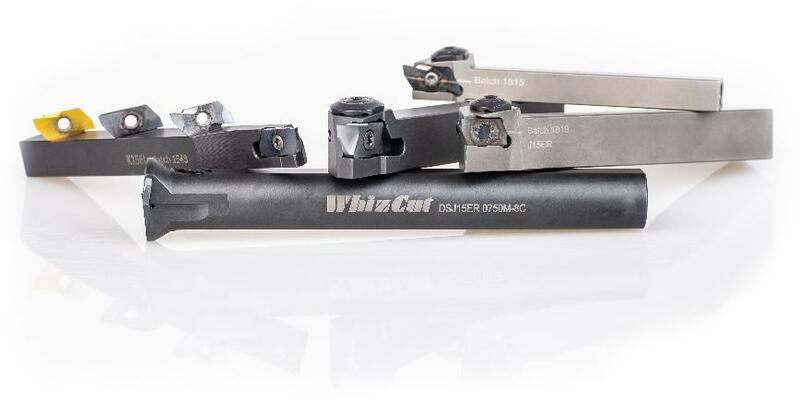 The WhizCut-line has tangentially mounted inserts which are ingeniously set at an angle in the tool holder. This gives you the best possible tool life, tight tolerances and smooth surface finish. WhizCut standard inserts all have sharp, fully ground cutting edges. Standard inserts are available between 2° and 20° positive cutting rake - to perform outstanding in every operation. Thanks to the inventive combination WhizCut inserts are up for any material or application challenge. You only need two types of toolholders to perform any operation with a WhizCut insert: J-type toolholders and K-type toolholders. The inserts are divided into two different application styles; “radial turning” and “front turning”. The toolholders for radial turning and front turning are optimized for their targeted application. - Perfect chip control and minimal cutting forces: all WhizCut inserts have complex cutting geometries and sharp, fully ground cutting edges. The entire range of inserts is designed to generate ultimate stability. - Flexible: WhizCut has a great assortment of inserts specially designed to fit all swiss type machies. - Save time: with the toolholder system WhizFix, you can index the insert with the toolholder still in the machine. Change or turn the insert around in only 15 seconds. - High pressure coolant: through the toolholders - is available for the full line of WhizCut inserts.